From a fashionable rooftop lounge overlooking Hong Kong’s sparkling skyscrapers to an air of excitement amid Macao’s flashy casinos boasting million-dollar works of art, we’ll guide you to the best modern finds in these thrilling cities. Whether you desire to shop at designer stores or sip cocktails in skyscrapers, Hong Kong is a dynamic city to experience the finer moments in life. Brimming with sophisticated malls, high-end arcades and bespoke tailors eager to custom-make your next suit, Hong Kong has long been a haunt of shoppers. While we love the high-fashion brands in The Landmark district, with The Landmark Mandarin Oriental, Hong Kong in its epicenter, we’re also fans of the NoHo enclave. Aptly named for its location north of Hollywood Road, this hip locale is a hub where lifestyle-design stores and cold-pressed juice bars are intermingled with more familiar names like Caudalie skin care and Guess fashion. 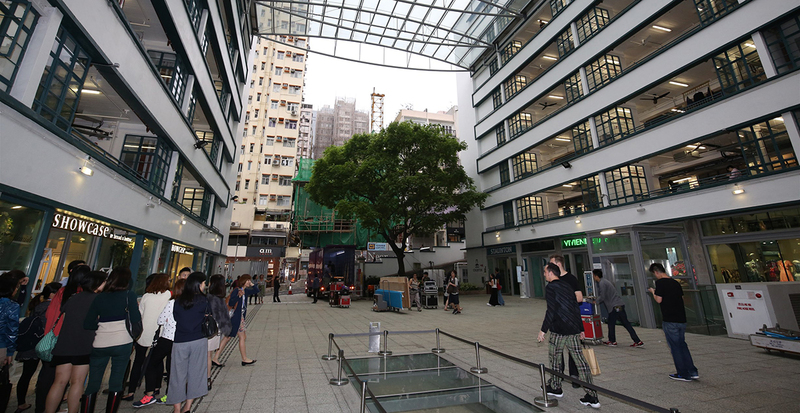 A sense of tradition perfectly intertwines with contemporary flair in PMQ, the former Hollywood Road Police Married Quarters that were transformed into a vibrant creative space. After strolling among design studios, fashionable boutiques and pop-up exhibitions, make time for cocktails and bar bites at Aberdeen Street Social — where British fare gets a makeover from Michelin-starred chef Jason Atherton. Our favorite: a rustic ploughman’s lunch with an upscale twist, featuring artisan farmhouse cheddar cheese and a perfect Scotch egg. In this city of skyscrapers, take in panoramic views of the dazzling night skyline or gleaming perspectives of Victoria Harbour. 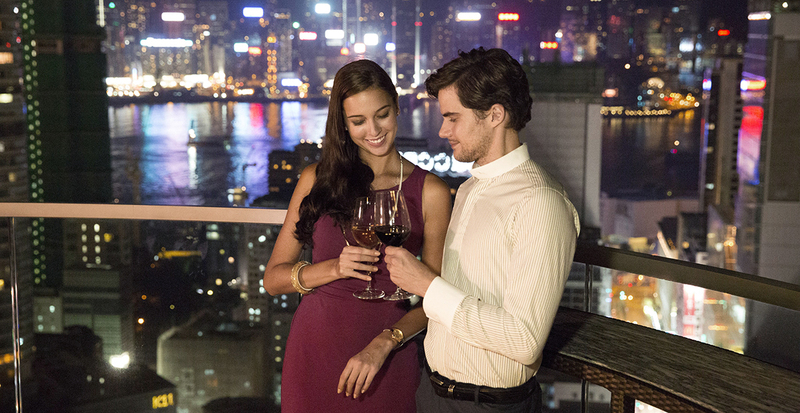 This is city living at its best, whether you’re sipping a sweet lychee sangria and nibbling on Spanish tapas at Tapagria in The ONE Hong Kong or mingling over East-meets-West cocktails on the 25th floor of The Landmark Mandarin Oriental, Hong Kong at Mo Bar. Even daytime adventures come with a view as you plunge into the heavenly (and heated!) rooftop pool at The Langham, Hong Kong. When we reserve your vacation in Hong Kong, we’ll make sure to find the environment that perfectly suits your sense of style. 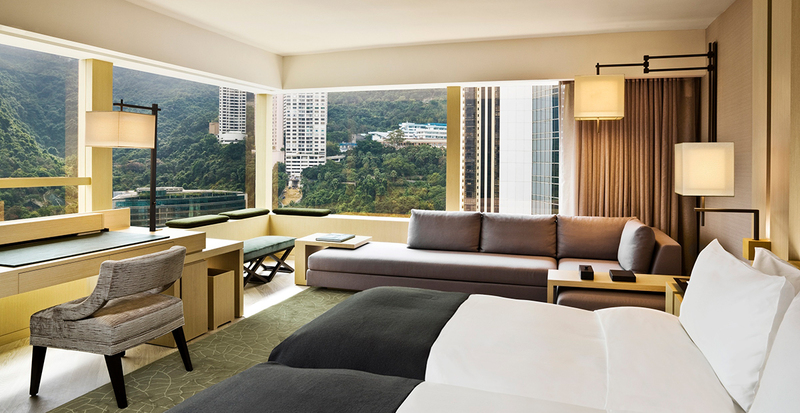 Perhaps you’ll want to position yourself among the bright lights of Kowloon, where breathtaking views of Victoria Harbour and two-Michelin-starred Chinese cuisine complete your stay at Kowloon Shangri-La. Or maybe you’ll be drawn to the inviting surroundings of The Upper House, where the warm décor among 117 rooms and suites feels closer to a residence than a resort. Book with us and we’ll provide you with additional privileges such as daily breakfast as well as a welcome gift of wine and chocolate or $100 in hotel credit. 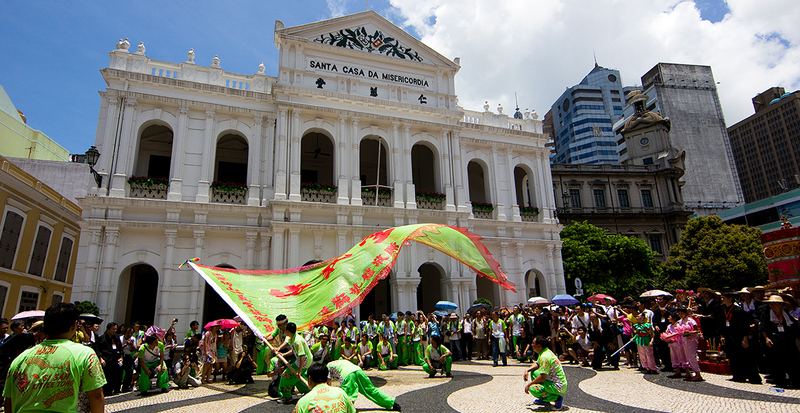 Born from a mélange of cultures and traditions, Macao has evolved into a contemporary city that’s worth a closer look. 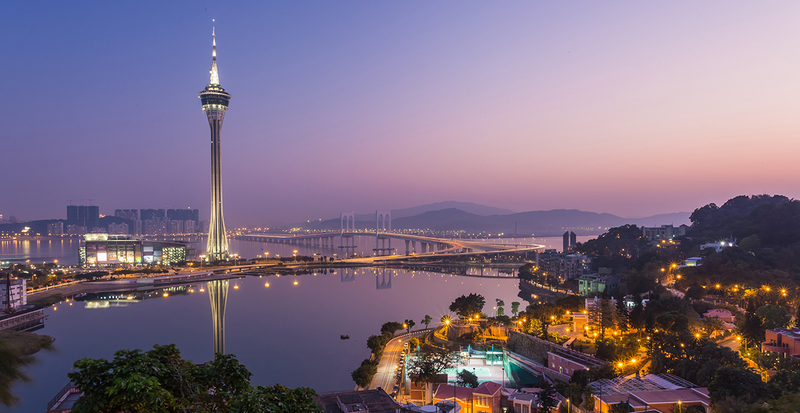 There’s so much happening within the city’s soaring icon, Macau Tower, that you’ll want to return again and again to experience it all. At 360° Café, the eye-catching display of Chinese, Portuguese and Indian cuisine is matched only by the breathtaking panoramic views, or get a taste of Portuguese-Macanese flavors with a traditional pork chop bun and savory codfish at Tromba Rija. Beyond dining, make your way to the observation deck for sky-high perspectives and, if you dare, take the leap from the top on a bungee jump or stroll around the perimeter — from the outside — on a thrilling tower walk. You’ll feel as if you’re in Europe when you stroll among the neoclassical buildings and paved pathways of Senado Square, part of the UNESCO Historic Centre of Macao World Heritage site. Holidays are always a joyful time to explore: paper lanterns and sparkling lights adorn the streets during the Mid-Autumn Festival, Christmas and Chinese New Year. Explore the historic buildings bordering the square, and spend time perusing artifacts within the Museum of the Holy House of Mercy, where the veranda offers an elevated perspective of the square. Creativity runs deep in this city with its array of galleries and creative, yet some of the best art is where you least expect it! 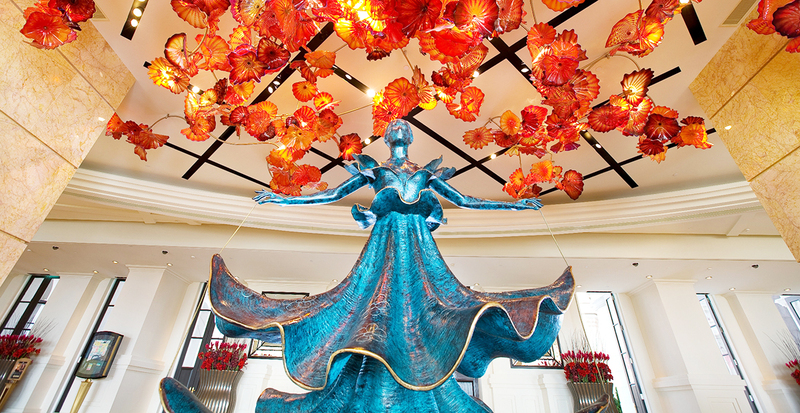 In the high-energy resort casino of MGM Macau, exhibitions rotate within a 5,000-square-foot gallery perched at the top of the grand staircases. You’ll also spy two sculptures by Salvador Dalí along with an oversized “bouquet” in Jeff Koons’ “Tulips” display. Contemporary and classic art is also scattered throughout Wynn Macau, like a richly detailed Louis XIV Beauvais Chinoiserie tapestry woven from wool and silk and twin cloisonné camels made of delicate metals and glossy enamel. With a 270-degree view theater, every perspective is incredible when we reserve your seats for “The House of Dancing Water.” Created and directed by Franco Dragone (of Cirque du Soleil fame), this visual and technical masterpiece — a love story on water — features nearly 100 high-flying performers adorned in dazzling costumes amidst dancing fountains and shimmering pools. 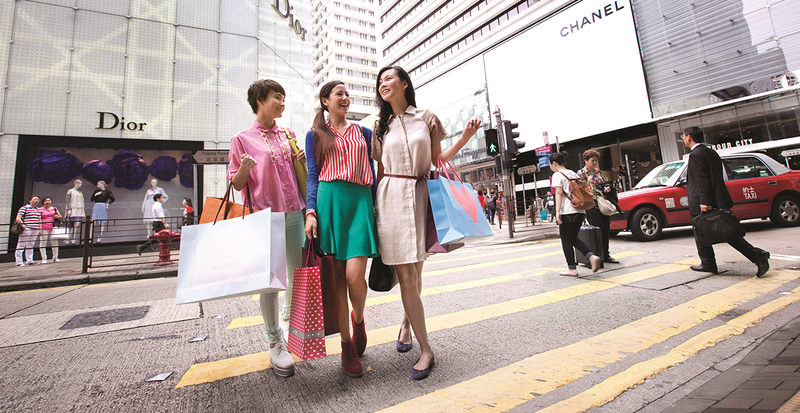 From high-end dining to high fashion and high art, let us book your vacation to Hong Kong and Macao today!